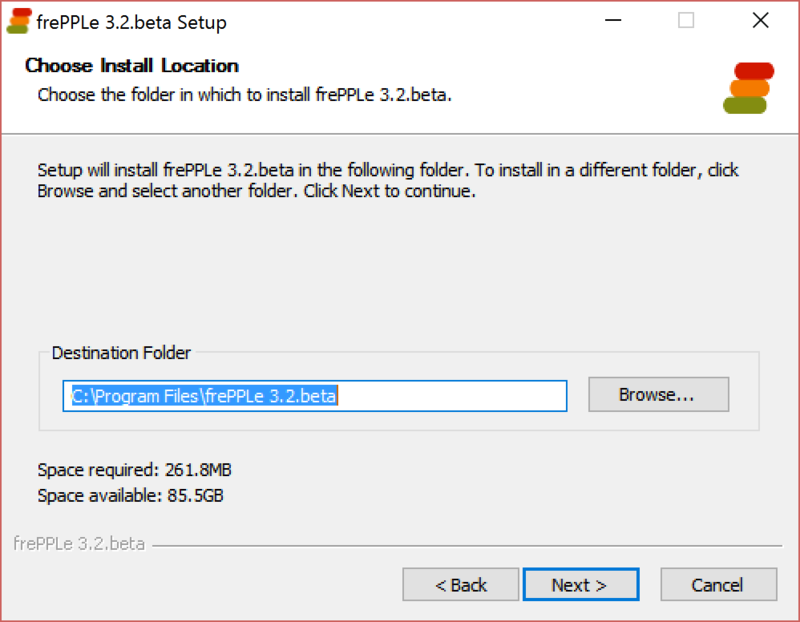 The installer is 64-bit and has been tested on Windows 7, Windows 8 and Windows 10. 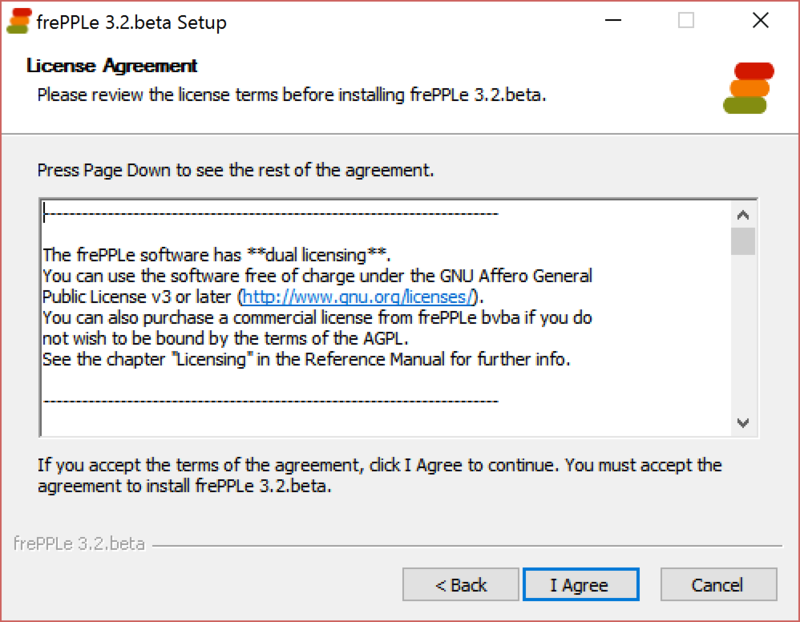 FrePPLe is released with a dual license: you can choose either to apply the GNU Affero General Public License (aka AGPL) or to buy a commercial license. A different location is selected depending on the user name. 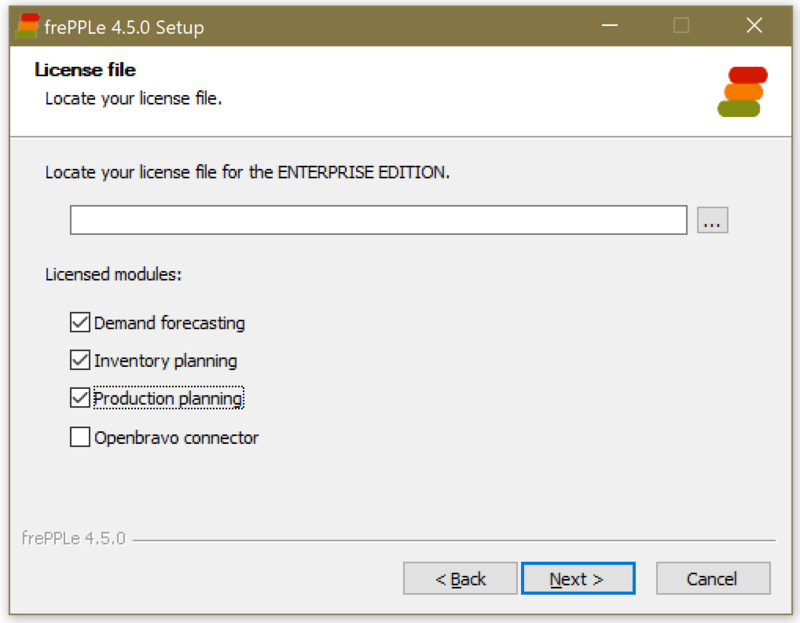 The Enterprise Edition requires a license file to be activated. You get the license file when you register your copy on the support section of the website. The license file contains the customer name, validity date and licensed modules. Optional extra components can be enabled. Install and configure the PostgreSQL database. PostgreSQL 10 or higher is required by frePPLe. You can choose to use either 1) the postgreSQL included with frePPLe, or 2) install and configure PostgreSQL yourself (advanced users only). Cancel the frePPLe installer and restart it again after the postgreSQL installation is done. Download and run the postgreSQL installer. Use the PgAdmin administration tool to create a login role for frePPLe. If you intend to use the default login role “postgres”, you can skip this step. See http://www.postgresqltutorial.com/postgresql-roles/ for detailed steps. Use the PgAdmin administration tool to create a database for frePPLe. Make sure to assign the login role created in the previous step as the owner. See http://www.postgresqltutorial.com/postgresql-create-database/ for detailed steps. Advanced administrators can further fine-tune the database instance. For a simple trial installation, you want to skip this. The default configuration of PostgreSQL is not configured right for intensive use. We highly recommend using the pgtune http://pgtune.leopard.in.ua/ to optimize the configuration for your hardware. You will not be able to the next screen when a test connection to the database fails, or if you followed the regular install. Your selections are saved in the file custom/djangosettings.py. The file can later be edited with a text editor. 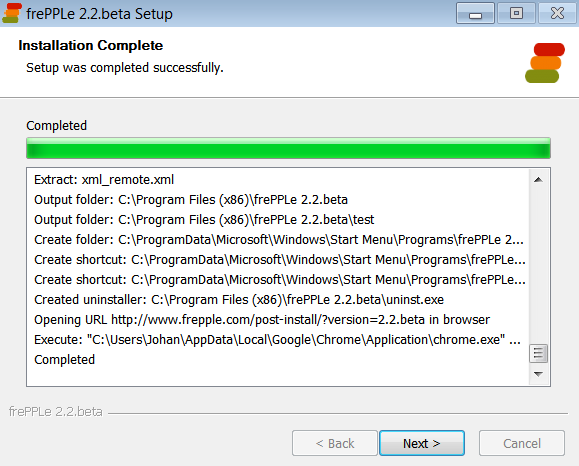 During the actual installation you can see the list of installed files, and monitor the creation of the database schema. At the end of the installation you can choose to start the server immediately. For a test or development installation it is recommended to run the server as a system tray application. For an installation in production mode AND when you have administrator rights on your computer, you can chose to register and start a service instead (currently in development). Either it was already started at the last step of the installation process. Select “Run frePPLe server” from the program menu to start the web server in the system tray. If you’re new to frePPLe, this method is preferred. Select “Start Service” from the program menu or the Windows service manager. 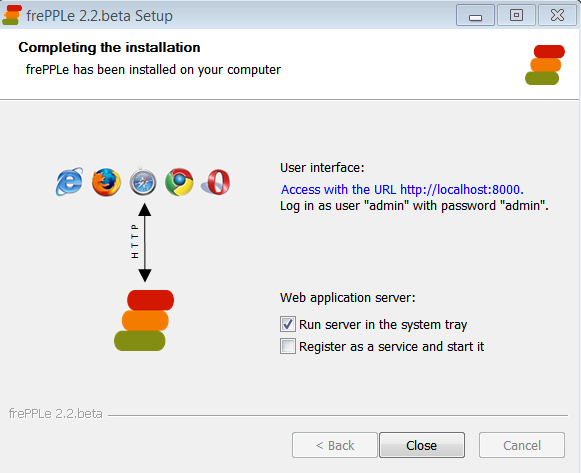 This option is available only when you choose to register a service during the installation. 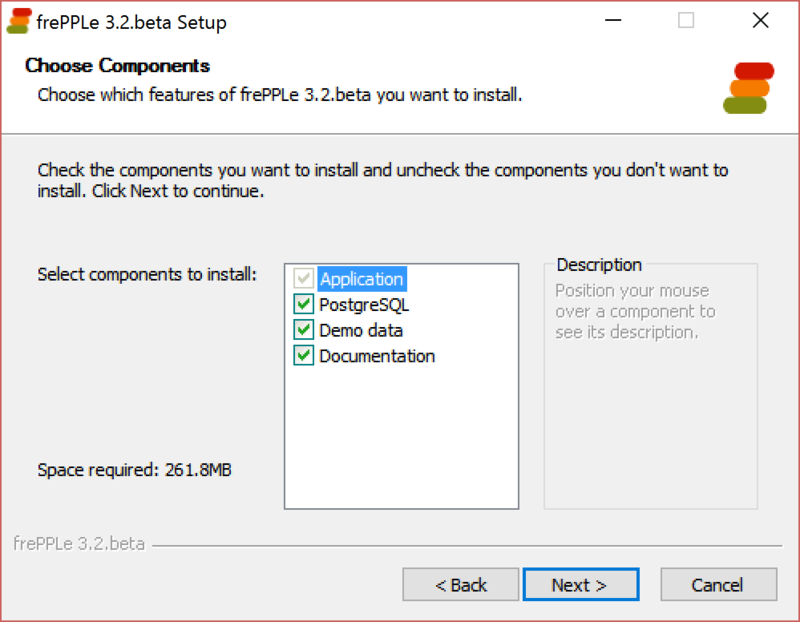 If you want to run frePPLe as a service and you use the PostgreSQL database provided by the installer, you need to update the service such that it runs with the same log on as the user that installed frePPLe. By default the service is registered to run using the local system account, which will not allow it to connect to the PostgreSQL database. You’ll get a server 500 error message in this case. You can type in the URL manually or double click the system tray icon. An administrator user account is created initially: admin with password admin. Change the password of the admin user as soon as possible. Leaving the default password may be convenient, but is considered a security risk. 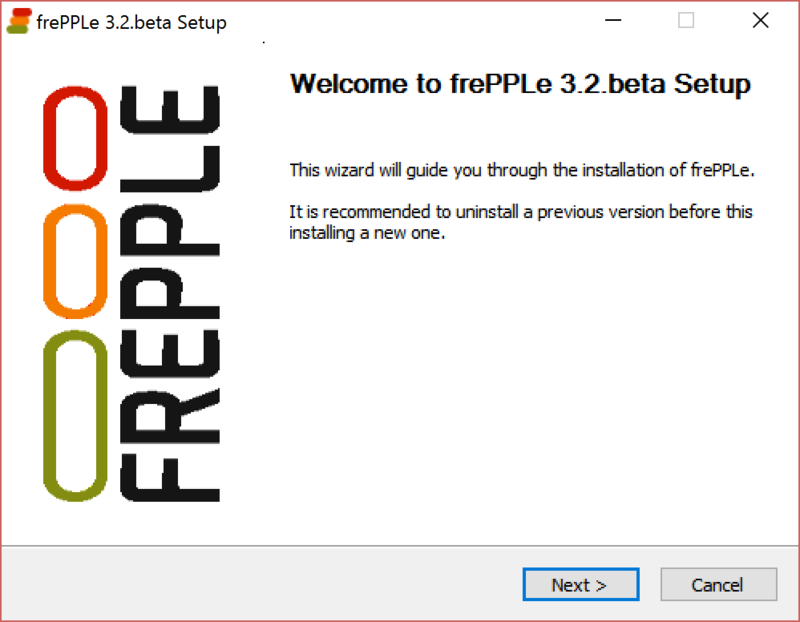 Multiple versions of frePPLe can be installed on the same machine, but not when using the PostgreSQL database included with the installer. Multiple installations of the same release can’t. If you’ld need such a setup, it is better to install once and create different copies of the custom folder. Each copy will get need different parameter file djangosettings.py.